How to make Maya feel as natural as a pencil in 2 weeks, click the same buttons as the pros, and ONLY focus on the art of animation. ...Used to be my gut reaction every-time I opened the software back in school. Everything about it was a confusing chore then. The graph editor looked like an endless math problem. Constraints were 3 hour nightmares that ran on loop. And gimbal lock felt like a surprise time bomb happily blowing up all my animation right before my eyes. "Why is this so hard?! All I want to do is make animation! Should I be a graphic designer or a 2D animator instead?" Thankfully I didn't let the software make me quit. I grit my teeth until I finally felt confident and comfortable with Maya. The sad part is it was a long 5 year journey. 2 years were spent just getting good at the basics. Like understanding the graph editor. Or how to setup a decent animation workflow. And what took even longer, was the advanced skills, that made me a much faster and capable animator. Skills that allowed me to setup animation friendly constraints in minutes, completely avoid gimbal lock, or use custom hotkeys and scripts to animating much faster. Looking back now, its obvious why it all took so long. Back then I was lucky to find an instructor who even knew what Maya was - let alone be able to animate well in the software. In fact the best animation instructors I had were 2D artists who knew very little about how the software worked. Asking questions about the graph editor, useful scripts, or constraints - was a Hail Mary. Every traditional school I attended did teach Maya. But unfortunately this meant that they taught every. single. part. of. Maya. Modeling, rigging, rendering, shading, lighting, texturing - every artistic skill set was covered. What a bore. What a waste of time. All I wanted to do was animate. And when we eventually did cover using Maya for animation it felt skimmed over. I wished I could of skipped all this hassle. If I had better instructors or courses that were tailored specifically to animators - I could have learned everything I needed to succeed in a month or less. Have you wanted to learn 3D animation but you've gotten so overwhelmed with Maya that you didn't even start? Have you struggled with the graph editor, constraints, and other techy bits at school but nobody ever gave you clear answers? Or have you joined a Maya course that has the answers you need, but its turned out boring, confusing, and bloated with useless extra lessons? Maya For Animators is your secret hack to making Maya feel as natural as a pencil in your hand and animating like a pro. It will eliminate the bore, the confusion, and the overwhelm that often comes with learning Maya. Its quick, its practical, and its built only for animators. In just 2 weeks you'll have all the essentials down to animate, and you'll already be using some of the shortcuts the pros use. Will walk you through the basics of animating inside of Maya step by step in just 2 weeks. Basic Navigation that will have you animating in 7 minutes. Basic animation workflow, a simple process for creating great animations and setting up Maya to help you do animate well. Custom animation hotkeys, scripts, and settings I've used to animate on movies like X-men and many other pros use. ​Where to find character rigs, how to reference rigs, and set up your scene for convenient animating. How to animate a complete ball bounce beginning to end using everything you've learned (from custom hotkeys to basic workflow and scene setup). ​With Maya For Animators you'll have access to a private community where you can ask more detailed questions, get animation career advice, and team up with other students. Occasionally there will be live Q&As or demos to help you learn more about Maya and speed up your workflow. And the best part - when any new additions, live events, or updates are added - you get free access. Maya For Animators doesn't stop with just the basics. Throughout the entire year, there will be more advanced Maya lessons added into the course. So as you level up your animation skills you'll be able to return to this course to help you grow even more! These are great for both Maya newbies and Maya veterans. All of them can drastically speed up your workflow, and make complicated animations much easier to handle. I appreciated how thoughtfully the course was laid out. Only what we needed to know for animation is what was included. Each topic built on the last and made good sense. Plus, I now have a “nudge” script back in my arsenal! I lost it over the years haha. I’m maybe a bad example as I’ve used Maya for almost 10 years. Refreshers on the basics is always good. I would have liked to have had a course like this when I started learning the software. It certainly would have gotten me over some hurdles much much quicker. Each of the lessons are helping my workflow a lot! I really like the course, I learned a lot already. I like how it is structured, the comment section where we can post comments and ask questions that you reply in a really short time. you need to check out this class! Are you ready to use Maya like a professional animator? An Unbeatable Guarantee: Try Maya For Animators for 30 Days Care Free. Maya For Animators is designed for you to quickly become confident with Maya - even if its been a struggle for you in the past. But I want to make sure that it really does work for you. So if you're don't absolutely LOVE it - I insist you get 100% of your money back. Join the course and give it a go. If MFA doesn't get you animating quickly, understanding the graph editor better, or speed up your workflow - email me. And you'll get your money back no questions asked. This guarantee lasts 30 days which is more than double the time it will take you to complete all the basic lessons in the course. Meaning you can try out the ENTIRE course to see if its the right fit for you. How is Maya For Animators different than other Maya courses? Every other Maya course or school program out there is bloated with a lot of useless lessons on rigging, modeling, texturing, and unpractical tools professional animators never use. MFA cuts all that fluff. It's designed from the ground up only for Animators. So it focuses on what professional animators use everyday. And it goes much deeper into the nuances of animating like custom hotkeys, scripts, and workflow that other courses skip or have no clue about. I'm a complete Newbie will this work for me? 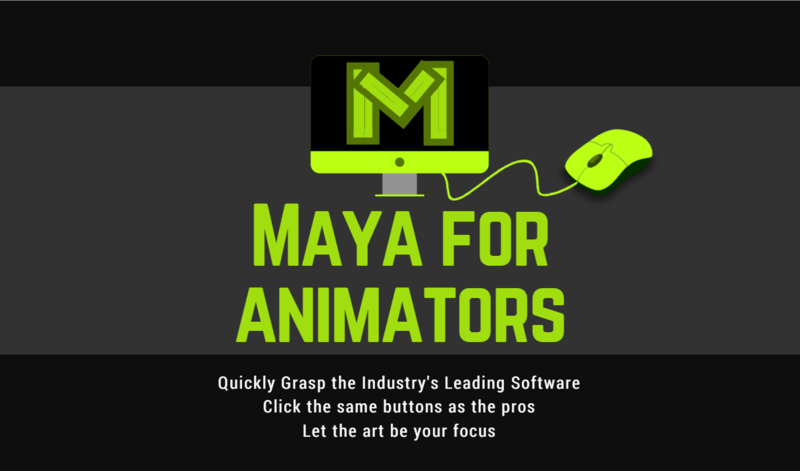 Maya for Animators is built exactly for you. Its an entry level course that gets you prepared to animate ​by showing you how to use the software so well you almost forget its there. I'm a veteran Maya animator will this work for me? Several experienced Maya animators have beta tested this course and discovered a lot to speed up their workflow. The advanced lessons will probably give you all new approaches to constraints, spacing switching, animbot insights, and more that will make animating even easier. That said the basic core lessons probably won't have much new info for you but I wouldn't be surprised if you discovered some new custom scripts, and hotkeys. ​How long does this course take? In 2 weeks you'll learn all the essentials you need to comfortably animate inside of Maya. After that there are advanced lessons you can dive into whenever your ready for them. Will this course teach me the fundamentals of animation? No. This course will introduce you to some basic animation concepts, but it primarily focuses on how to use the software to animate effectively. Learning the software is the first step to animating in 3D. Learning the basics of animation is completely different topic that I cover in my Animation Fundamentals course. If joining Maya For Animators makes the difference between you getting your student loans paid or eating – do NOT buy this course. Spend the money on your basic survival first. This won’t bring helpful pressure to the artistic challenges you’ll find inside. I truly want what’s best for you and if money is that tight this course is NOT what’s best for you right now. If you invest in MFA you probably won’t let it go to waste.